Many youngsters are High school dropouts and the very shocking question that comes next in their mind is that What next ?, How they can live a comfortable life with a secure job?. But do not worry, there are many jobs available which doesn’t need much of a resume formalities or much of qualification. Even though if there isn’t any scope for high school dropouts in top MNC companies or as a qualified professionals such as Chartered Accountant or doctor but you can still have a successful career. There are some jobs available where you can have a lifelong successful career without any tension about job security. Many high school dropouts have become millionaire and billionaire, so being a high school dropout is not a big deal and you can still work and survive in this world. Opting for being a General Manager in a Restaurant is also the best shot for you. If you have a great skill in communication and managing the restaurant then you have greater chances of cracking this interview and getting a guaranteed job as a Restaurant Manager. They can also be called as food service managers who see the daily function of the restaurant and see that the food and beverages are been served adequately. If you always love to work in an office and you are great with working with teams then an Executive Assistant Job is the best job for you. For being an Executive Assistant you don’t need much of experience and qualification if you have the basic knowledge about the computer and day to day management of the company. But still, it is going to be a challenge of cracking this interview because there are many people who apply for this job having minimum qualification. For this job you just need a commercial driver’s license and great skill for driving a Heavy Truck. In this job, you will just need to transport goods from one to another and no technical skills needed for this. But the backlog for this job is that you may have to work alone for days or for some weeks too. There is also a heavy risk associated with such job because they may have to drive on mountains. There are good number of High school dropouts who work as construction managers. You can earn nice amount of salary with lifelong secured job. Also if you take some courses in leadership or management skills then you will get immediate promotion and chances of securing a position as a manager. If you love cars and vehicles and most importantly if you love repairing them then Automotive Service Mechanic job is the best job option for you because with necessary experience and courses, you can make this job as your profession. Working in bigger companies needs a lot of technical knowledge, so you need to take computer classes so that it becomes easier for you to work. Working as a Sales representative is a very great job with a lot of opportunities loaded with this job. There are so many successful entrepreneurs that have a success story that they first started as sales representative and have then ended up as the CEO or director of the company. This job always offers promotion and a lot of opportunities to explore thus people are very passionate about this job. A Sales representative gets awesome salary package. There are many jobs that are looking for Administrative Assistant and the best thing about this job is that they don’t mind much of qualification formalities for this job. A basic Computer knowledge and good communication skills is needed for this job. The only difficult thing is going to be that you may have to crack the interview and very few get through such interviews. If you have great ideas and you want to bring them forth and showcase your product or your service then such a person with a profession is called an Entrepreneur. There are many success stories about high school dropouts such as Richard Branson who was a high school dropout and then went on a journey to become the founder of Virgin Group and is one of the most successful entrepreneurs in the world. Take some management courses so that you can lead and make your company successful. There are many old age homes where they need people to help them in taking care of the old people by giving them a bath or giving them medicine on time. To be a caretaker doesn’t need much qualification. But to get this job you need to have a humble personality and a good physical stamina and good communication skills. It is not the highest pay jobs but it is for the people who want to do social service and help people. A Diesel Service Mechanic has to check the cars and trucks diesel engine whether it’s working smoothly or no. You can get a nice salary and it is expected the employment rate to go higher by 2024. You need to have good communication skills, customer service skills, mechanical skills and troubleshooting skills. A good physical strength is also needed because of the nature of the job. There is always a need of Electrician thus working as Electrician always has job demand. Many companies such as manufacturing companies or automotive company need Electrician because they are mostly about fixing, repairing and etc. Electrician earns good amount of money yearly with a good decent amount of hourly rate. Electrician responsibilities consist of repairing machinery, installing, maintaining, lightning and it is important to have good communication skills. A machinist job is to make machinery tools such as metal parts, tools and instruments. 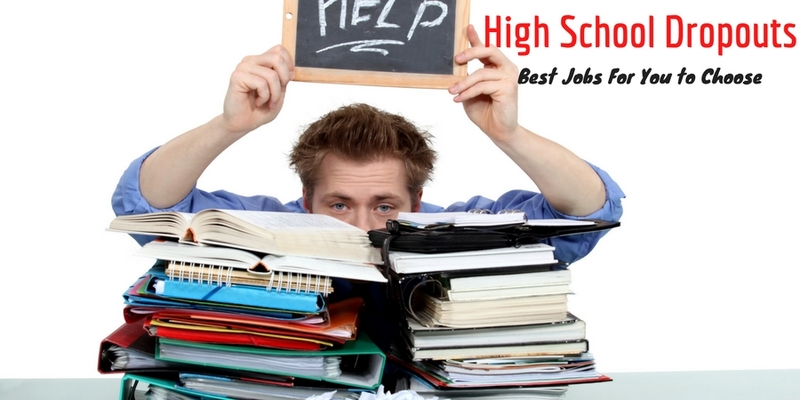 Many High school dropouts opt for this job because it is very basic job and qualification is not much needed for this job. This job needs some technical skills and mechanical skills but you need to have some math head because you need to be careful and smart in doing such jobs. The Salary of a Machinist is average and it is okay for comfortable living and survival. Construction workers dosents need much of qualification or any formalities such as any courses or classes to be attended. If you are very strong and very good at heavy lifting then this job is suitable for you. If you are choosing to be a construction worker then that can be good career only for a short term basis because there isn’t much growth and it is not a long time career job. The salary of an construction worker is average which is good for basic living and necessities. Hairdressers and Barbers earn average amount of money and it is reliable if you have a partner also working. If have a great skill in styling hair or if you are very good with doing make up then you can earn handsome amount with this job. There are many people who go for this job who have great taste and who are very creative. Becoming a hairstylist or a makeup artist doesn’t need much qualification but joining some courses or classes can help in getting into top hairstylist companies. A welder is profession where the welder has to join metal parts and do some finishing work by filling up holes and etc. Welding jobs have to work in a compact space or places which are safe for welding items. Welding is not a easy work because it increases a lot of risk such as fire or injuries. There may be a need of lifting heavy items also. You will need practice for this job because welding is also a skill which not many people can do it easily. Carpenter is also a good choice for the high school dropouts because it doesn’t need much qualification and carpenter jobs are needed for a wide variety of works. Carpenter jobs include building door frames, stairways, rafters, tables, chairs and lot of products that needs specialisation of carpenter to make variety of stuff. If you have to install a drywall, kitchen cabinets or siding then a carpenter is useful for such installation works. Cranes or Heavy machinery is used in construction work and for the machine to work, you need a heavy equipment operator. A heavy equipment operator need to have the necessary licence and practice in operating such machines. It is not an easy job to do because it is an heavy machinery and little mistake can lead to heavy losses and damages. The job can be done at any time of the day or sometimes it is done in the night also, so it has odd hours of work time. Where there are houses, there are pipes and there is a need for a plumber for every resident. A person who wants to be a plumber need not have any educational degree but simply have knowledge about pipes and the water distribution system. They need to have the basic knowledge regarding installation and repairing of pipes for all kinds of buildings and houses. Plumbers need to have the necessary specialized tools and equipments which would be needed for the plumbing work. The higher the level of efficiency is, the better will be the professional position of the person in the future. During the school days, the person maybe fascinated by paints and if they have dropped out from high school then they can begin by taking a job of a painter. People normally look to remodel their interior as well as exterior of their houses and they first begin by changing the colour of their walls and other surfaces. A painter should have knowledge about different colours and match and mix them accordingly. Their basic job is to paint the surfaces such as walls, canvases, doors, cabinets, etc and have all the necessary equipments such as high quality paint brushes, sand paper, cleaners, etc with them. Masons are needed for people living in houses as well as for any government cementing work. Masons smoothen and level out the concrete and cement at construction sites. They even get jobs for smoothening out roads, sidewalks, bridges, etc. If a person is a college dropout then they can initially begin working as a mason to earn their income. To become a roofer, a person doesn’t need an educational degree but just a steady hand and no fear of heights. A roofer has the job of maintaining and repairing the roofs of individual houses and buildings. A person living in the suburbs would really benefit to begin their job as a roofer. Depending on the type of roof, the necessary equipments and tools should be used to perform that job. Such kind of people need to have an alert body and mind and may also need a well maintained physique. A security guard can even initially join a security agency to boost their chances of getting a job soon as the pay is satisfactory and no educational qualification would be needed. People who do not have a degree or diploma shouldn’t get discouraged that their professional life has come to end. There are a number of options which the person needs to rightly consider and ensure that they pick and grab the best opportunity in front of them. Leaving or dropping out from school may just be the start and there must be something even greater waiting in the future. It is just down to how the people picks their options and keep a positive mindset. The most important thing to remember is that never give up and keep on trying till you reach their goals.